On October 3rd (my 47th birthday!) I was "pushed" out of India's Trivandrum Airport within minutes of the expiration of my flight permit for that country. By the time I had dragged myself through the paperwork formalities at Madras, flown from Madras to Trivandrum, then went through the lengthy manual refueling process described in my last report, I'd been up for over thirteen hours. Now, I had just taken off for what was to be a twelve and a half hour flight to the Seychelles. I lifted off from Trivandrum at about 6:30pm local time, just about 45 minutes before sunset. As you can imagine, the challenge was to keep awake during this little endurance test. The setting sun gave way to darkness very quickly, but thank goodness there was a full moon to provide at least a little optical stimulation. I also dove into my ham radio hobby in earnest on this leg, switching the HF over to the 20 meter ham band whenever I wasn't busy communicating with ATC. I made a large number of contacts (see "Ham Radio" above), and these short radio chats went a long way toward keeping me awake. A few scattered thunderstorms over the middle portion of the route also provided enough of a navigational challenge to keep the brain cells alive, but by ten hours into the flight I was literally slapping myself with bottled water to stay awake! I have never been so relieved to see the lights of an airport as when the Seychelles Airport came into view. I landed, cleared formalities in just about ten minutes (better than India by far), collapsed into a taxi, and flopped into bed at the hotel. 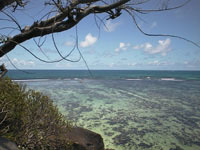 When I awoke the next day I discovered that I had unknowingly landed in paradise! The Seychelles are the closest I think I'll ever see to heaven on earth. Warm, sunny, friendly, clean, and best of all for me by this time, relaxing. 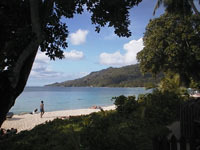 With lovely beaches, romantic desert islands, coral reefs, unblemished countryside, and fantastic offshore fishing, the Seychelles Islands have it all! 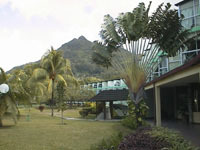 For that reason it has become a prime honeymoon spot for European couples. My one day "tech stop" somehow managed to stretch out into a three day "goof off" stop! 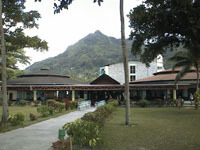 Photos of the lovely beach resort where I "roughed it" in the Seychelles Islands. I joined this tour group in a glass bottom boat to explore the colorful tropical marine life on the coral reefs offshore from the main island of the Seychelles. 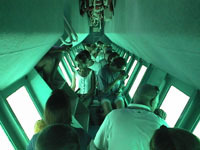 A pair of multilingual tour guides sat in the middle with a PA mic pointing out the various fish and coral varieties as the boat slowly passed by them. Given the wide diversity of the group, the commentary was repeated in English, French, Creole, and German. Several South Africans complained that the Afrikaans language wasn't also included, but the guides had to draw the line somewhere! 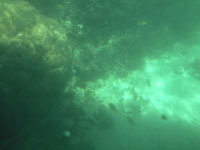 One view from the glass bottom boat. 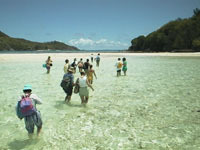 Here the tour group is wading ashore on the Seychelles' most interesting little island. This one has no dock, so the boats drop passengers in knee deep water for the short sloshing walk ashore. We had no complaints, as the water was crystal clear, very warm, and blessed with foot caressing soft sand. The island is infamous in this part of the world, as tradition has it that pirates buried treasure here more than 200 years ago. No one has found any yet, but one dedicated fellow was so convinced that he actually bought the entire island back in 1962 for about $24,000. A former British journalist, he has now retired to his modest home on the island and lives there as a bachelor treasure hunter to this day. He hacked his way through the lush tropical greenery over the years to create a number of delightful walking paths around the island. Two tour boats come here each day, dropping tourists (this time including our intrepid Mooney pilot) for a day in paradise. And what a paradise it is! Splendid beaches, perfect weather year round, a huge variety of flora, fruits like coconuts, mangos, bananas, and kiwi literally falling on the paths in front of visitors, a specially protected colony of giant tortoises sluggishly traversing the paths, and even a few old building ruins and graves dating back 150 years. 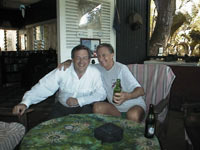 Here I'm sharing a drink with island owner, Brendan Grimshaw. This was taken on Brendan's island house verandah by one of the natives who come to the island each day to help the frisky septuagenarian maintain his little piece of heaven. A number of famous visitors have preceded me to this chair, including Omar Sharif, who waded ashore with a camera crew a number of years ago to film a documentary here. Brendan struck me as a somewhat eccentric, yet thoroughly lovable character. Brendan has authored a book on his experiences on the island, and I thoroughly enjoyed reading my autographed copy from cover to cover. One tropical vista seen from a hand cut pathway on Brendan's island. The existence of pirate treasure on the island has yet to be proven, but the fact that at least one pirate ship used Brendan's island as a home base is now well accepted. 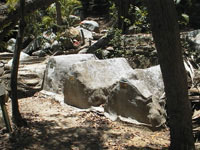 Two pirate graves were discovered a number of decades ago, and when he bought the island Brendan had these small monuments erected over the two graves. When his father passed away a few years later, Brendan buried him right next door (presumably with the father's pre-death concurrence!). There is only room in this tiny cemetery for one more resident, and Brendan is holding that space for himself. As the tour boat collected its passengers at the end of the day for the return to port, Brendan came running out to bring one of the visitors a wristwatch he had accidentally left behind on the beach. As Brendan handed the owner his watch, both lost their balance and fell flat into the water. Here is a soaked Brendan showing his good sense of humor after the other participant in the unscheduled swim (blue shirt, facing aft) climbed back aboard.